Manipulating a cellphone was a contributing factor in more than 800 crash deaths on U.S. roads during 2017 amid a marked increase in the percentage of drivers observed interacting with cellphones, new IIHS research indicates. The estimated number of deaths, however, still represents a fraction of the overall crash death toll. This estimate is based on work by IIHS and other researchers describing how the estimated risk and prevalence of phone use can be combined to estimate the number of crash deaths that could be attributed to phone use in a given year (see Status Report special issue: phoning while driving, Feb. 27, 2010). The 66 percent increase in fatal crash risk associated with manipulating a cellphone relative to driving when other secondary behaviors were present is a finding of a 2018 study by the AAA Foundation for Traffic Safety and the Virginia Tech Transportation Institute. Cellphone use affects how drivers scan and process information from the roadway. Drivers generally take their eyes off the road to dial, send texts and browse the web on a hand-held phone — all activities that fall under the rubric of manipulating the phone. 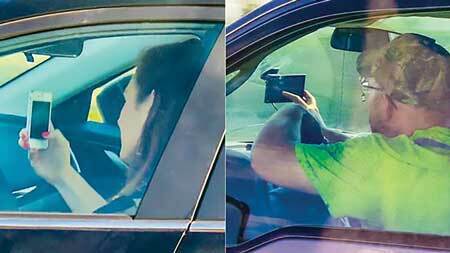 Drivers engaged in cellphone conversations tend to concentrate their gaze toward the center of the roadway, but their attention still may be diverted from driving and make it difficult for them to process what they are looking at. Procedures for the 2018 update followed those used in 2014 (see “Distracting behaviors are common at red lights, less so at roundabouts,” March 31, 2015). IIHS stationed observers at 12 locations across four Northern Virginia communities, on straight stretches of roads, at signalized intersections and at roundabouts in March 2018. Observers noted nearly 12,000 drivers in the 2018 survey and more than 14,000 drivers in 2014 during the morning, afternoon or early evening on weekdays. Researchers noted if drivers were engaging in one or more of 12 visible secondary behaviors while moving or stopped at red lights. Manipulating hand-held cellphone. Excludes looking at phone in mount. Simply holding hand-held cellphone, i.e. not obviously manipulating or talking. Wearing Bluetooth earpiece or headset with mic. Wearing headphones or ear buds. Manipulating in-vehicle system. Touching radio, climate control, touchscreen display or other controls; excludes operating stalks or buttons on steering wheels. 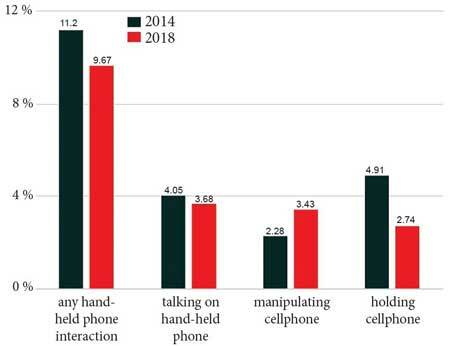 Manipulating or holding mobile electronic device other than cellphone. Other - reaching for object, reading print material, adjusting sun visor, putting on glasses, holding another object. 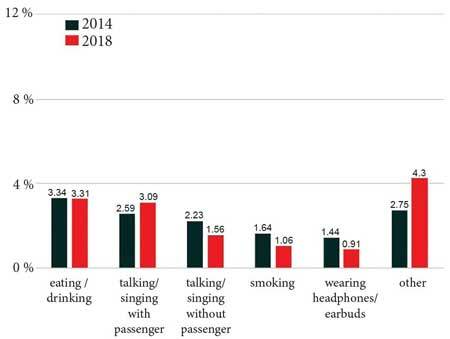 About 14 percent of drivers were engaged in nonphone related secondary behaviors in 2014 and 2018 which exceeded the proportion of drivers seen using phones in both years. Relative to 2014, drivers were more likely to be observed manipulating an in-vehicle system, grooming themselves, or manipulating or holding an electronic device other than a phone after researchers adjusted for community, perceived driver gender and age, time of day and roadway situation. The percentage of crash deaths related to distraction in recent years has hovered at about 8–10 percent of all crash deaths, data from the National Highway Traffic Safety Administration show. During the past three years, distraction affected crash deaths have trended downward. The number of fatalities in distraction affected crashes fell 9.3 percent from 3,490 in 2016 to 3,166 in 2017, representing 8.5 percent of total fatalities for the year. In 2015, 3,526 people were killed in distraction affected crashes.